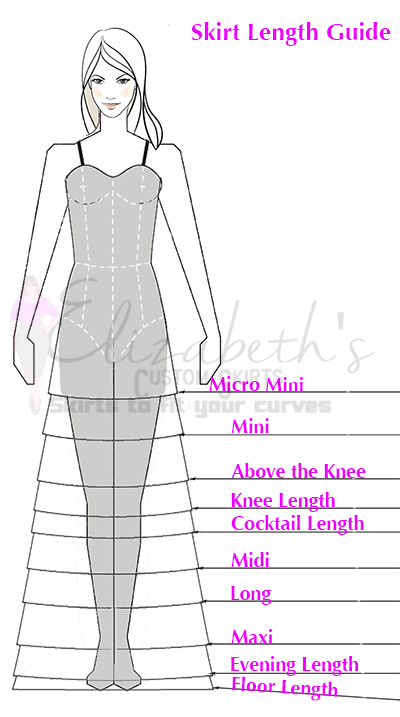 The image above will give you an idea on how to take measurement in regards to your skirt length. When measuring for your skirt length, persons should stand straight and measure from your natural waist down the side of your legs to your desired length. If possible you may want to get someone to help you. Once we sew your skirt the waistband will not be in the measurements given to us, therefore if you submit a measurement of twenty two inches (22’’) when you receive the skirt, that skirt will have a length of twenty two inches (22’’) plus one and half inches for the waistband, making the total length twenty three and half for regular skirts. For high waisted skirts two and half inches (2 ½’’) will be added to the skirt length submitted. The length for skirts without waistband (self waist) those skirts will remain with the length you submitted.